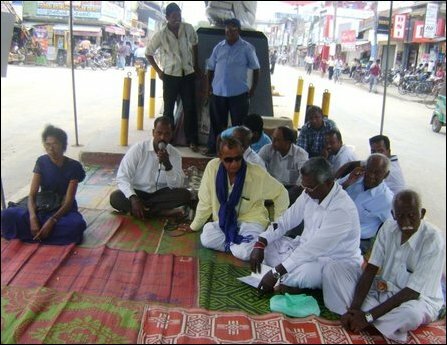 Velmurugu Thangarajah, claiming as the Jaffna district organizer of the Sri Lanka Freedom Party (SLFP), organised the fast and a demonstration. The protestors held placards condemning the Tamil diaspora, the British government and the UNP politician Jayalath Jayewardene. Members of public moving in the area did not mind about the protest. Two persons, Ramanathan Ankayan and Velmurugu Thangarajah, are at odds with each other, claiming the position of Jaffna District SLFP organiser. Ramanathan Ankayan unsuccessfully contested the general election on the UPFA ticket in the Jaffna district. Velmurugu Thangarajah has been facing several cases in courts on allegations that he had defrauded several thousand rupees promising employment to youths.